The Georgia Aquarium is the largest aquarium in America, containing over 100,000 animals from 500 species. Creatures from all around the world are are displayed here, from whale sharks and manta rays, to sea lions and sea otters, penguins, sharks and a riot of colourful fish. The Aquarium also has a 4-D theatre that features an animated 3-D film, interactive seats and live actors, as well as a café and the Ocean Ballroom for special events. A popular attraction is the Dolphin Tales show, where features choreographed musical performances by the dolphin stars. 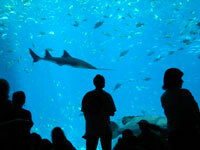 Transport: The Aquarium is connected to the Five Points MARTA Train station by bus. Opening times: Sunday to Friday 10am-8pm, Saturday 9am-8pm. Extended hours apply during holidays. Admission: $36 adults, $30 children 3-12 years. Ticket prices vary according to season, check the website for specific dates. Free audio tours are available.